I like this. I can imagine some very tired parents in the corner trying their hardest to ignore the fighting. That’s the benefit of having the ability to tune out shrieking, screaming, and other chaos. My boys were always really well behaved when they knew I could hear them. When they thought I couldn’t it turned into a less violent version of the Sharks and the Jets without the music and dancing. Girls (my granddaughters) seem to be easier but I still have to step in between one of the 8 year old girls and her 15 year old sister. *sigh* I’m about to cast the Mother’s Curse on them…Grandma Version. Exactly. Kids are here to test our sanity. But the upside is you eventually get grandchildren and you can use them to make your kids crazy! Too funny. This reminds me of my childhood with my three siblings. Ha. LOL they are so funny! Another fun read, sorry, but I enjoyed breakfast with children who wish to eat ‘coz both my children pick on their food for survival. Not sure whether I am to work on building my cooking skills or fine tune their eating skills, either way food times are madness here and the mad person is ME! Oh my goodness! This certainly put a smile on my face remembering breakfasts from long ago. My kids are all grown up with kids of their own, but I have fond (and sometimes frustrating) memories of breakfast antics. Thank you for this awesome read! haha…hilarious one…keep on posting…Awesome !! Ha ha ha! This is great. 🙂 What a lively breakfast that you have. (Completely loved how you started, that your day doesn’t get going with meditation and yoga!) Blessings and Light to you and your kids. ~Debbie ps – I just did my first online forgiveness intro on Friday. I am so happy that I did it!! Went really well & it’s a part of me really getting out sharing in my authentic voice. Oh that’s a neat idea. Probably not this one though … just because participants shared some really deep stuff. (It’s interactive via Zoom, if you’ve heard of that technology). I like your thinkin’ though, very creative! ❤ Hope your weekend was wonderful. 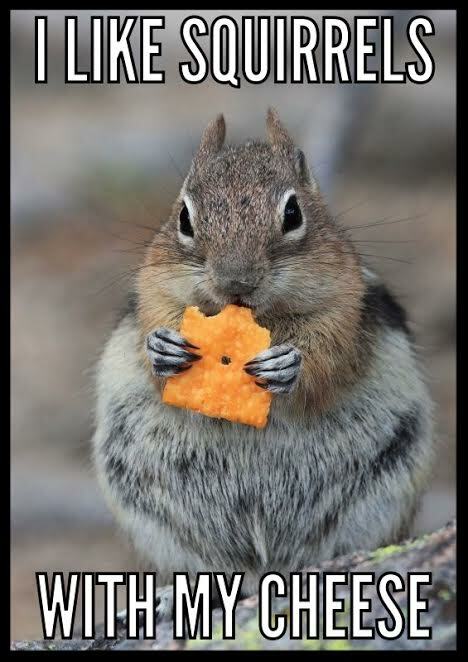 I like cheese – squirrels, not so much! Cute story! I, too, wonder when I realize that I’m the most normal person in the room, although for me that usually happens with adults around me. Of course, cheese is a constant in both our stories. Normal, shnormal. It’s a head scratcher. Quirky works well for me. I enjoyed this a lot! LOL! My mother was deaf so she really had NO idea of what went on … some may see it as a defect but maybe it was a blessing? I’d suspect that even if a person doesn’t start off deaf prior to having six energetic kids at large, they’re bound to suffer some degree of hearing loss with all the high-decibel shrieking and blood-curdling screams that kids are notorious for unleashing. We didn’t need to scream, only when tortured. Mum lip read so long as we covered our mouth we could say whatever we liked and she had absolutely no idea. Must admit i think letting off steam that way kept the decibels lower … and there was no one to hear. I’m exhausted – I don’t know how you cope. Thank goodness I have forgotten what all that was like. Will check out the blog shortly!